1. Wash and dry the wings, coat with oil. Season with 2 tablespoons of the curry powder, onion, garlic, green onions, thyme, pimento, ginger and the tomato. Massage seasonings into the wings, cover and let sit for an hour or overnight in the fridge. Pour 2 tablespoons oil in a deep-frying pan. Sprinkle 1 tablespoon curry in the hot oil and move the pan around so that it gets seasoned. Add Scotch bonnet pepper to flavour the oil. Scrape the seasoning off the chicken and brown it in the pan on both sides. Pour hot water into the pan (on the side, not over the chicken) to half cover the chicken. Cover the pot. Once it comes to a boil, lower heat and let the chicken cook for half hour. Check periodically to ensure the water does not boil down too low. Twenty minutes in, add potato and at the half hour mark, add the seasoning you scraped off earlier. Simmer until the seasoning is cooked. 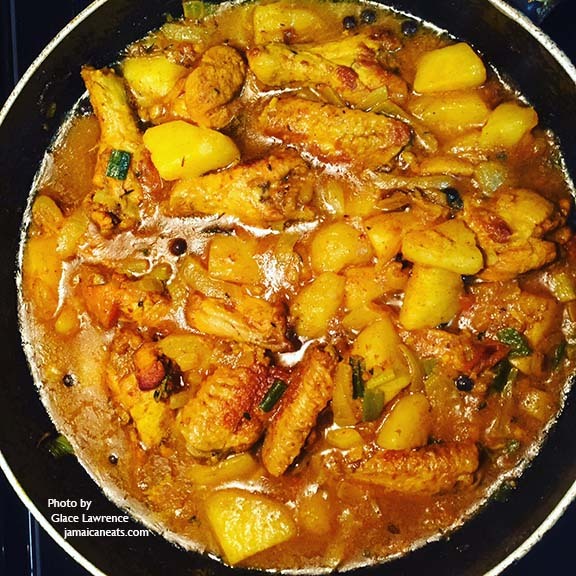 If the potato doesn’t thicken the curry, remove some of the liquid curry (not the seasoning) and add 1/2 teaspoon flour or cornstarch. Stir to dissolve then pour back into the pot and stir. Gravy should be thickened in 10 minutes.